Spurred by boredom and maybe a touch of mid-life crisis, a political science professor quits the security of academic life and with just the cash in his pocket, a worn-out station wagon and a cargo of books hits the road in search of something - different. economy and the highest unemployment rate since the Great Depression. His new colleagues include ne'er-do-wells, zanies, bohemians, underachievers, and people temporarily or permanently "down on their luck." He joins the "new poor" - an unprecedented class of downwardly mobile people for whom university degrees, diligence, and doing "everything right" have lost their force - and he becomes himself a misfit who can't, or won't, hang onto a job. During his travels he makes a catch-as-catch-can living as an adjunct professor, a field worker, a department store clerk, a civil servant, a door-to-door salesman, a janitor, a car washer, a day laborer, even a seller of blood - his own. This is a close-up view of the dark (and now largely neglected) side of the 1980s, also of a subculture which lives just below the surface of middle-class American life and which shares neither in its affluence nor its aspirations. It's a fouryear stroll on the wrong side of the tracks, a tale reminiscent of George Orwell's Down and Out in Paris and London, yet leavened with a dash of humor. 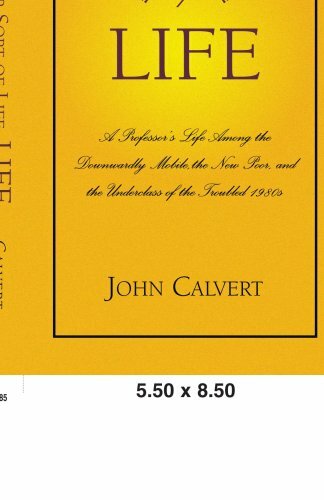 John Calvert is a former professor of political science who has taught at several colleges and universities in the United States, as well as Germany, Sicily, the Azores, China, and Ukraine. He has been a regular faculty member, an exchange teacher, and an adjunct professor. Retired from teaching, he remains active in the educational reform movement Currently he lives in Fargo, North Dakota.